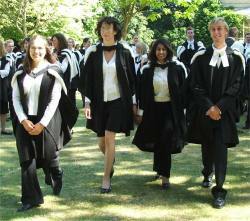 Degrees are conferred by the University at a ceremony in the Senate House known as a Congregation. People due to take a degree ('graduands') are presented for their degrees to the Vice-Chancellor (or deputy) by an officer of the College known as the Praelector. The Praelector for Fitzwilliam College is Dr James Aitken. Administrative assistance to the Praelector is provided by the Tutorial Officer in the Tutorial Office, L Staircase. If you are not able to attend in person, you may proceed 'in absence', when your name will be read out and the certificate sent to you after the ceremony. Alternatively, you may choose to attend a later Congregation. Please note: A degree is not officially awarded until it has been conferred on you either in person or in absence at a Congregation of the Regent House. Your degree certificate will be issued only after the degree has been conferred. Students will not be put forward for graduation until they have settled their College and University bills. *'In absence' means that Fitzwilliam College will not be presenting anyone in person at the Congregation. Your certificate will be sent to you after the ceremony date. Advice and resources about jobs and careers.